After the ink dries on your Judgment of Divorce, what’s next? 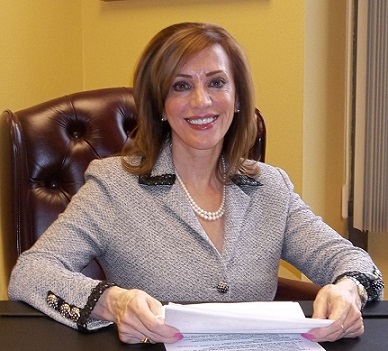 Hi, I’m Mindy Hitchcock, founder of Lady4Justice PLLC and a Michigan family law attorney with 30 years of experience. There is one thing that attorneys consistently fail to tell their clients once the divorce judgment is signed, and that is there are still things that need to be done to secure the assets you received in your property settlement. This is understandable, since attorneys are released from your case once the judgment is entered. Unfortunately, most clients then assume that everything they need to do has been done. And nothing could be farther from the truth! It is devastating to lose retirement benefits, lose your right to lien a property to secure money your ex-spouse owes you, even something as simple as being told by social security or the secretary of state that you cannot change your name to the name your received in your judgment. Saddest of all is that ALL of these things areEASY to do. But you have to know what they are. 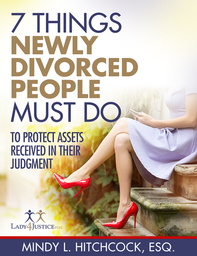 That’s why I wrote 7 Things Newly Divorced People Must Do to protect assets received in their judgment. It tells you everything you need to know, along with stories of what happened to people who didn’t. It may feel like it’s over, but it really isn’t until you take these simple steps to PROTECT THE ASSETS YOU WERE AWARDED IN YOUR DIVORCE! Click on the book for a free download.